Jean de Dieu Momo, Minister Delegate for Justice of Cameroon. 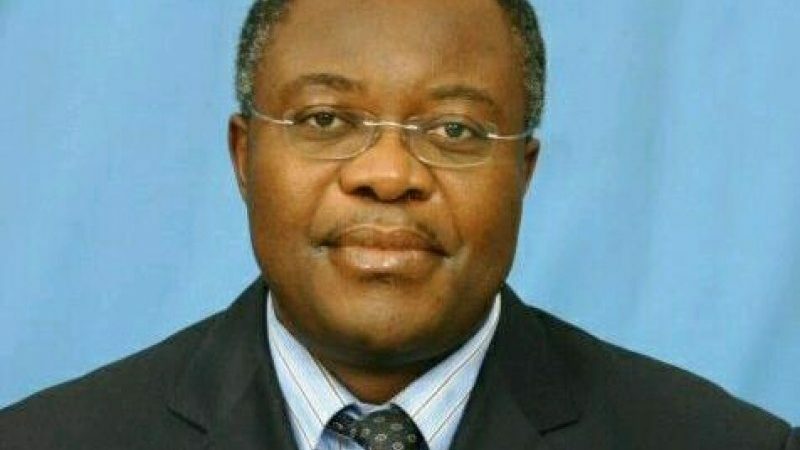 Official photo from the Cameroonian government website. On February 3, in an interview on public television in Cameroon, Jean de Dieu Momo, minister delegate for justice, provoked quite a stir when he warned opposition leader, Maurice Kamto, that he was leading Cameroon’s Indigenous Bamileke people to a fate similar to that of the Jewish people during the Holocaust in World War II. Momo made the comment on a public television program called News Weekly in a discussion with Kamto on the state of Cameroon and the ongoing conflict between Francophone and Anglophone regions that has gripped the nation. Anglophone Cameroonians, who make up 20 percent of the population, have felt increasingly marginalized by the Francophone-led government. The crisis has led to a crackdown on English-speaking regions of Cameroon and renewed an Anglophone secessionist movement after “hundreds have died, close to 500,000 have been displaced, and activists have been rounded up and jailed,” according to the Washington Post. The televised discussion began to focus on a more specific ethnic tension between two of Cameroon’s major ethnic groups, the Beti and the Bamikele people. The Beti align with Francophone Cameroon and Cameroon’s President Biya, also a Beti. The Bamileke align more with Anglophone Cameroon and are most notably represented by Biya’s main political opponent, Maurice Kamto, a Bamikele. In Germany, there was a people who were very rich and who had all the economic levers, it was the Jews. They were so arrogant that the German people felt a little frustrated. Then one day came to power a certain Hitler, who put these people in gas chambers. Educated people like Mr. Kamto need to know where they bring their people. Ironically, Momo himself is also Bamikele. Given his powerful position, political analysts say his outrageous comments functioned as a warning to his community not to aggravate an already tense and fragile ethnically-charged situation. Bamikele were, in fact, victims of genocide 50 years ago. Experts believe that between 100,000 to 400,000 Bamikele people were killed between 1959 and 1964 during France’s “secret war” in Cameroon. The French and their local allies enacted these killings mostly in western regions of Cameroon, where Bamikele have lived for centuries. Bamikele people have continued to experience discrimination, neglect and lack of representation in political and social spaces and were targeted in 2012 for expulsion from Yaoundé, the capital. Momo’s anti-Semitic remarks disturbed many and caught the attention of the embassy of Israel in Yaounde, Cameroon’s capital. The embassy published an official statement expressing its outrage and requested an immediate apology. Israel has a diplomatic presence in 11 out of 54 African countries and has sustained prolonged diplomatic ties with Cameroon since 1986. The Israeli embassy says the relationship dates back to Cameroonian independence from France in 1960, however. The Cameroonian government disavowed the minister, stating that Momo “spoke in his personal capacity” and did not represent the views of the government. Authorities further denounced his “inappropriate words,” dissociating itself entirely from the anti-Semitic declaration but have not yet issued Momo any kind of official reprimand. The Middle East Monitor reports that President Biya “has used special security and military units trained by Israeli security companies to quell demonstrations against his rule,” mostly in English-speaking parts of the country. Momo’s provocative comments spread like wildfire on social networks, calling his expertise into question as someone familiar with genocide and crimes against humanity cases. Momo is best known for his work as a lawyer at the United Nations International Court of Justice for Rwanda since 2006 and his activism on the issue of human rights. Yet, his remarks feed into the global rise of far-right movements that have revived racist tropes that the Jewish community controls the finance world. His comments, under the pretense of “real talk”, seemed at odds with his prior experience and his identity as a Bamikele, a historically oppressed group. Il n’a rien dit de si grave, j’ai écouté l’extrait. Soyez moins frileux. Nothing serious here, don’t be such a snowflake.